When Sun Xiaowei got her job offer from Chinese online radio platform Qingting.fm two years ago, she had no idea where to put her Party registration documents, as the tech startup had not set up their Communist Party of China (CPC) branch yet. The online platform was established in 2011 when more than 3,000 radio stations began sharing their programs. Unlike government-related enterprises in China, the Shanghai-based tech startup did not see a Party branch become established until October 2016. More and more Chinese tech companies have been setting up CPC branches recently, a way to better communicate with authorities while enhancing corporate management. In Shanghai, the total revenues generated in the information technology sector grew 14.1 percent year-on-year in 2016 to 690.4 billion yuan ($105.3), media reports noted on Tuesday. The sector has more than 680,000 employees while 554 firms have reached millions in revenues, reflecting the urgency of Party building, Zheng Jianlin, deputy head of the Organization Department of the CPC Municipal Committee of Shanghai, was quoted as saying in the media reports. "The experience of exploring Party construction work at grassroots level is to integrate the work into the most active economy," Zheng noted. Tech companies in Shanghai are not the only ones that have highlighted the importance of CPC branches. Nearly 6,000 Party members have registered in 34 leading Party groups supervised by the Beijing Internet Association (BIA) so far, and US-listed Internet companies such as Baidu and Sina are among those groups, media reported on August 25. Additional tech companies such as question-and-answer site Zhihu and photo-sharing platform Kuaishou filed applications to the association to set up Party groups in the first half of 2017. Qingting.fm has also been mulling over the establishment of a CPC branch throughout recent years, particularly after hiring graduates like Sun, who had joined the Party at university but had no place to put her Party registration documents after graduation, said Pan Cong, head of government relations at the tech startup. "As a platform that compiles radio station content, we have to examine the overall content and so we recruited some talents from traditional State-owned media outlets like China National Radio," Pan said, explaining that the tech startup now has a foundation that allows the work of Party building. "Many have raised the question of where to put Party registration documents when they start working here," he added. The number of Party members has surpassed 40 and the company has about 300 employees, which shows the necessity of setting up a Party branch. China has been pushing forward Party building for years, and should be expanded into the private sector including private companies and emerging tech startups, Zhuang Deshui, deputy director of the Research Center for Government Integrity-Building at Peking University, told the Global Times on Thursday. "Meanwhile, it's designed to help improve the government's surveillance on Internet companies," he said. In addition, having a Party branch will help a private company develop closer relations with local governments, considered an effective way to receive policy support when it's needed, Zhuang added. China's Internet information services should be led by the Party, Wang Xiang, secretary of the Party committee of Sina Weibo, a Twitter-like microblog platform based in Beijing, told the Global Times on Thursday. "Enhancing the work of Party building will ensure healthy development within our Internet information services," Wang said, noting that the committee also set up a public opinion research group in May, which aims to manage and lead public opinion. Sina Weibo's Party committee became independent from Sina Corp in December 2015, and has now registered 227 Party members, accounting for 10 percent of the total number of staff members. Having a Party branch in a private company can be a binding measure for employees when it comes to carrying out certain administrative orders, noted Pan from Qingting.fm. "For instance, some Party members, who are also leading staff, are in charge of certain important tasks, for example, examining content," he said. More and more Internet companies are considering appointing Party members to key positions. A video sharing website themed around anime and manga Bilibili - particularly popular among millennials - has promoted some Party members to senior positions in areas such as content examination and marketing, Shanghai-based Party newspaper Jiefang Daily reported on Tuesday. However, some Chinese companies have gone public in the US by saying that they would not comment on their Party committees or Party building work, which is likely to raise some concerns over their foreign investors, an employee from a US-listed Chinese tech company told the Global Times on Wednesday. It is common practice for State-owned enterprises to have Party committees, but big non-state-run companies like search giant Baidu and telecom company Sina have also set up Party committees in recent years. Party organs within non-State-run firms have also served as the Party's fortress and political core for employees, the South China Morning Post reported in June 2015. Besides those, a recent photo showing a statue outside the office of Chinese Internet giant Tencent, which reads as "follow our Party, start your business", has sparkled discussion on Twitter. China's burgeoning Internet sector has been proving its influence in recent years. Extending Party committees into Internet startups could become a pilot experiment for further setting up Party committees and branches within other private businesses, Zhuang noted. The number of Web users in China surpassed 750 million in the first half of 2017, and the total market value of listed Internet companies was recorded at more than 7 trillion yuan as of the end of July, media reported on August 24. A company's Party committee helps to drive team building, which in return strengthens communication among employees, Chinese one-stop life service platform Meituan Dianping said in a statement sent to the Global Times. 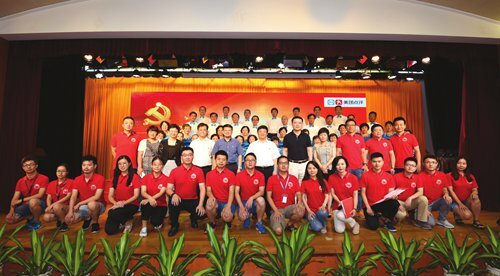 Party committees also help to enhance the understanding of the country's core socialist values as well as to demonstrate corporate social responsibility. "Some foreign investors only focus on ideological and political perspectives when a Chinese tech company sets up a CPC branch committee, they forget that this is also a way to improve corporate management and employee bonding, which is also key to the company's success," Zhuang noted.